I really need to post more often. I have been accumulating events in my head and photos on my laptop but that's where things have been ending. So, here is a bit of catching up. Last Sunday Cinco and I did the famed Around the River Ride. We started in York at his house and road to the east shore to get things started. The weather was cooperative for most of the ride. This was the first time for me, doing this ride without compact gearing, no whining! I forget how steep the hills were 2 hours into the ride. At times I felt my front wheel lightening up from the steepness of the grade and my super tall arse stepping on the pedals. I love the combination of terrain and length of the entire ride. By the end of the ride we logged about 7500' vert climbing. Felt good. 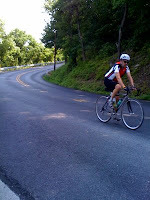 Here is Cinco rounding the bend on the only flat spot on Ducktown Road. He was rolling on the Pinarello Opera for the day. We stopped to top off the bottles at Samuel Lewis State Park. Italy's finest posing for the pictures. I joined my ex-co workers for the Sunday ride. This was a suffering of a ride for me with no excuses except when you get the idea in your head that it will be a hot day and removing your bug netting from your Rudy helmet may be a nice idea, DON'T! I got pegged square in through the front vent on a descent. I saw the bee coming, felt it slam into my helmet and instantly felt the searing hot pain like getting shot with a staple gun on the skull. I yelled, locked up the brakes, dumped the bike onto the should and ripped the helmet off. I brushed my head expecting to feel anything there to remove or brush away. Too late. I haven't been stung since elementary school. Being a head-shaven guy didn't help either. By then the main group and I decided to head to the nearest convenience store and get something cold on the wound. I rolled home, took a shower and planted my tired arse down for lunch. Thanks for waiting for me Blake. Matty G sent me this photo last week. He and his brother came over for a bike building session one night. I am shown here un-boxing what has now become my most favorite whip to date. 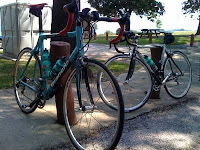 2008 Bianchi T-Cube Chorus. All stock and no schlock. Well not totally true as I am currently running a pair of Token C50s. I'll be rolling on them at RAGBRAI next week. 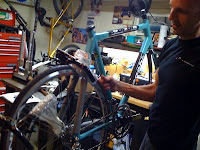 I do believe in this photo I am thinking, Damn this bike is light and finally Celeste Paint! There isn't too much that this bike can't do well. I just need to work more on the motor at this point, right? Ha! The 2009 T-Cube is relatively unchanged from this year's. The paint job will be slightly altered. There won't be the 'carbon panel' behind the logo and more natural carbon exposed at the rear sort of like the Barloworld frames of this year. Speaking of Barloworld, good finish for Robby Hunter in yesterday's Tour de France netting a 10th place finish for the very wet stage. Last week's Monday Night Ride out of Colonial Coffee Shop drew a fair size again. After an enjoyable roll through York County I was talked into meeting my boys at First Cap for a cold one. I have never been there and figured I could use dinner anyway. From l-r. Hank, Jason and Bets. 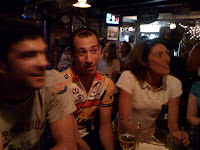 Bets is the mayor of First Cap apparently; according to Hank... Hank, Jason and Blake rode their fixies over to the bar. They are 'getting ready for Boulder, CO' as they put it. 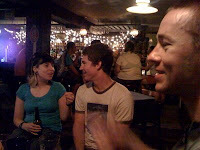 From r-l. Blake, Neil and Neil's friend girl. Sorry forgot her name already. I have spent some serious time with this crew and have enjoyed every single minute with them. Though thick and thin, we cycle, snowboard, eat/drink good times together. I couldn't ask for better friends. Cheers!